I’ve been critical of Twitter in the past for it’s frequent meltdowns. Unless you’re a celebrity, not everyone’s micro-movements and thoughts are interesting. Retweeting someone else’s work in my opinion is just viral plagarism. On a recent trip to London, I saw Zeebox and met up with the founder/CTO Anthony Rose. WOW! What an amazingly rich web and mobile application for watching television that actually brings meaning to Twitter. Perhaps Twitter is the interstitial for television delivered on web/mobile. It scrolls constantly as you’re watching the program and you can follow people related to the show. You can join and watch with friends, commenting about it with them in a private IM and then following stars in the show. Pretty darn cool for the ultimate couch potato! But watching Zeebox on the iPad is the game changer. That is it’s sweet spot and brings an experience of web 2.0 tagging (using real time natural language processing) and links to ecommerce sites where you can buy products contained in the television content. 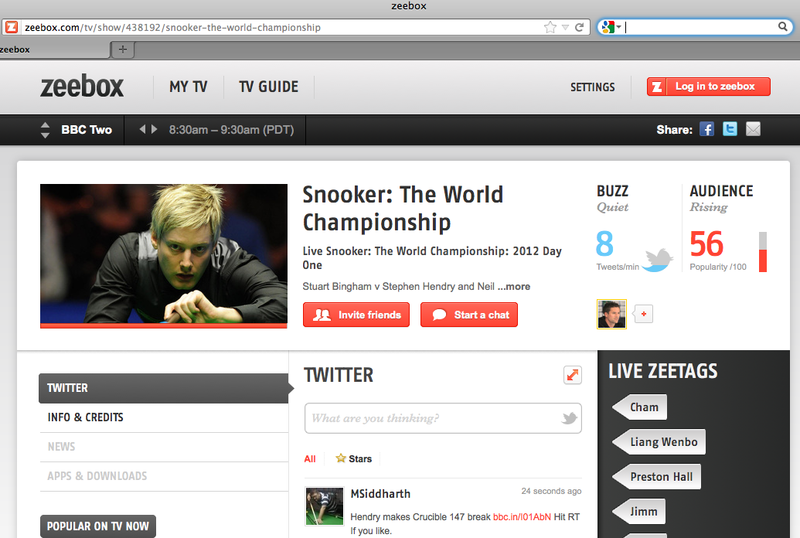 Tweet Tweet just might have found it’s home and saviour in Zeebox.